Specimen in its natural habitat. This species is apparently collected in West Bengal state, northern India. Dorsal view of head and anterior portion of body. Channa: from the Latin channe, used to refer to an unspecified species of sea perch. Appears to be collected in the vicinity of Alipurduar, Jalpaiguri District, West Bengal state, northern India which if accurate should correspond to the Buxa Tiger Reserve and/or the region just south of it. Alipurduar is located close to the Indian border with Bhutan and well over 1000 kilometres east of the Pakistan border, although C. sp. ‘five stripe’ is sometimes said to be present there, while the trade names ‘sp. Kerala’ and ‘sp. Kerala five stripe’ are misnomers since Kerala state is in southwestern India. 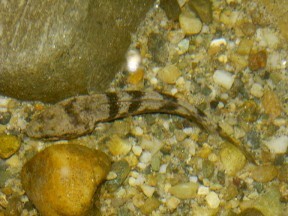 Based on its colour pattern and limited details regarding its natural habitat this species may be adapted to dwelling between and under rocks. Alipurduar lies in the moist tropical region of floodplains and foothills of the eastern Himalayas commonly referred to as the Dooars or Duars, traditionally considered the gateway to Bhutan. This area experiences a protracted annual monsoon season from June to September with average air temperatures between 12-32°C/53.6-89.6°F depending on time of year. Night-time temperatures are typically cold between November and February. An aquarium with base measuring at least 90 ∗ 30 cm is recommended for a single pair, with larger quarters needed for a group. Water depth is less important but should not be less than 30 cm. Prefers a dimly-lit aquarium with a layer of surface vegetation such as Ceratopteris spp. plus some submerged cover. It’s essential to use a tightly-fitting hood since Channa spp. 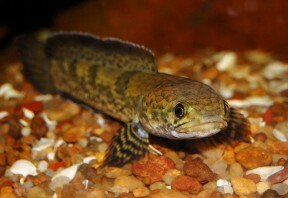 are notorious for their ability to escape, and a gap should be left between this and the water surface as they require access to a layer of humid air. More importantly still C. sp. ‘five stripe’ must not be maintained at a constant temperature but provided with natural seasonal variation in the form of defined winter and summer periods. During the colder period the fish do not require much food and the water level can be allowed to fall without additional top-ups. An obligate predator which probably feeds on smaller fishes and insects in nature but in most cases adapts well to dead alternatives in captivity. Some specimens even accept dried foods though these should never form the staple diet. Young fish can be offered chironomid larvae (bloodworm), small earthworms, chopped prawn and suchlike while adults will accept strips of fish flesh, whole prawns/shrimp, mussels, live river shrimp, larger earthworms, etc. As with the majority of predatory fishes this species should not be fed mammalian or avian meat such as beef heart or chicken. Some of the lipids contained in these cannot be properly metabolised by the fish and can cause excess fat deposits and even organ degeneration. Best-maintained in a species-specific aquarium. Females tend to grow larger and are deeper-bodied than males, especially when gravid. 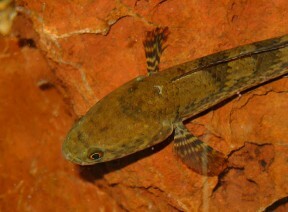 A paternal mouthbrooder which is bred on a relatively regular basis in captivity. This unidentified species has also been also traded as C. sp. ‘Kerala’ and C. sp. ‘umangii’. It has a characteristic colour pattern comprising a series of 5 oblique dark bars on the upper portion of either flank. Members of the family Channidae are commonly referred to as ‘snakeheads’ due to possession of large scales on the head of most species which are reminiscent of the epidermal scales (cephalic plates) on the heads of snakes. There currently exist over 30 valid species but diversity within the group is likely to prove significantly greater. The existence of distinct phylogenetic groups has been proposed with the putative C. gachua species assemblage of Britz (2008) containing C. orientalis, C. gachua, C. bleheri, C. burmanica, C. barca, C. aurantimaculata, and C. stewartii. Species from northeastern India have also been divided into the C. marulius and C. gachua groups (Vishwanath and Geetakumari, 2009). C. sp. ‘five stripe’ would likely be included in the latter assemblage which the authors characterise by possessing the following combination of characters: presence of a U-shaped isthmus; cephalic sensory pores evenly arranged in a single row; presence of one or two large cycloid scales on each side of the lower jaw; absence of a sharp prominent spine-like hypurapophysis; absence or presence of one tooth plate in the epibranchial; absence of an elongated urostyle. All Channa spp. 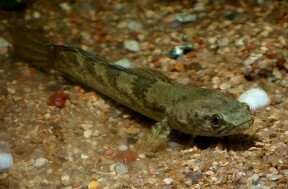 possess supplementary breathing apparatus in the form of paired suprabranchial chambers located behind and above the gills, although these are not labyrinthic but lined with respiratory epithelium. These chambers allow the fish to breathe atmospheric air and survive in hypoxic conditions or even out of the water for a considerable period of time, and in aquaria they are often seen rising to the surface to take gulps of air. Brede, N. and P. Antler, 2009 - Natur und Tier Verlag, Münster: 62 pp. Schlangenkopffische—Die Gattungen Channa und Parachanna. 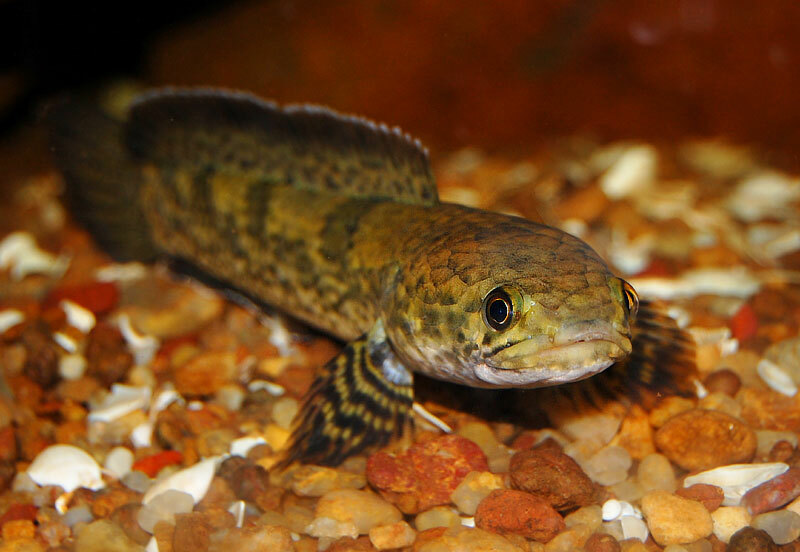 Channa ornatipinnis and C. pulchra, two new species of dwarf snakeheads from Myanmar (Teleostei: Channidae). Diagnosis and interrelationships of fishes of the genus Channa Scopoli (Teleostei: Channidae) of northeastern India.